It was but a few weeks ago that I found out that pepitas are nothing but pumpkin seeds. It was, however, with sheer dismay that I noted that no-one was even slightly curious what ingredient list it was, that I was reading. Not even the most astute and discerning of my readers wanted to know. So even though there was not quite the stampede that I was expecting and far be it from me to hide or hoard wonderful heart-warming recipes, here it is: savory Pumpkin Cheddar Muffins, with the goodness of pumpkin and pepitas, roasted peppers and sharp cheddar cheese. They are delicious with tea or with soup or even chili. Prepare the streusel by combining butter and flour (with a pastry blender or not) until it is crumbly. Add cheese, brown sugar and red chilli powder. Stir in the yummy shelled pepitas. Combine flour, cornmeal, salt, baking powder and baking soda in a large bowl. Combine egg, buttermilk, sugar, butter and pumpkin in another bowl ad whisk well. Pour this into the flour mixture. Line muffin tray with cupake liners. Spoon muffin mixture into each cup. 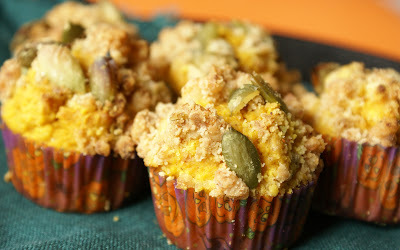 Sprinkle streusel topping over each muffin. Bake for 15 -20 minutes until golden brown. Allow to cool for about 5-10 minutes and serve warm with a warm cup of tea! Bliss! I used canned pumpkin and canned chiles. The canned chiles were rather mild so I used some pepper jack cheese instead of the extra-sharp cheddar cheese. I couldn't find my muffin tray so I made these in my mini-muffin tray. They would have been much better as muffins than mini-muffins. Although being bite-sized was not a bad thing, they would have been more moist if they had been regular size muffins. I wondered whether I should substitute butter as well as the egg yolk but really 4 tbsp butter and 1 egg yolk are not that damning, especially across 24 mini-muffins (or 12 muffins). So I didn't bother. This is great recipe to use all that glorious orangeness that comes our way this season. We really loved it! Recipe courtesy of Relish, a cooking pull-out that makes it appearance from time to time with our local newspaper. 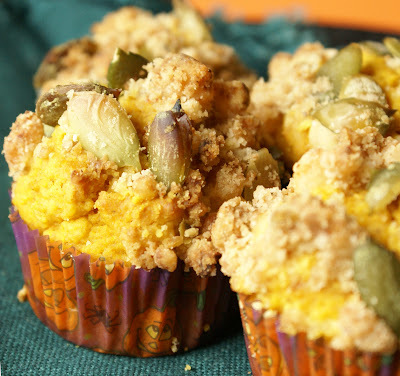 For an appetizing array of pumpkin recipes, check out Kalyn's post on BlogHer. This does indeed look like a great recipe! Now what can I replace the pepitas with?! Oh charemagaz, of course! 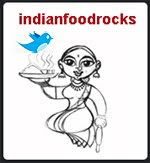 I am truly drooling - savoury muffins get my vote! I looked up Charmagaz and it is a blend of almonds, pepitas, cantaloupe seeds and watermelon seeds. Go for it! this is a truly unique recipe. the muffins look fun!! Not almonds - but cucumber seeds. It is supposed to be no almonds -no matter what all the web sources may say! Need your magaz for other things...so it will stay safe - from me at least! "...supposed to be a poor man's 'nut-mix' - therefore, no almonds." Aai ga! This is like taking an exam I tell you! I am almost tempted to hide my knuckles behind my back! I have no clue what charmagaz is - and Google insisted it was charmagaz and not charemagaz. Those muffins look so warm and inviting...love the recipe. Blasphemy alert: why do i think i can try totally savory mufins with this recipe ;). the chile powder is giving me ideas :-D. and i can see i have company in Anita :).